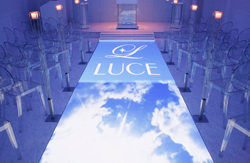 Blue lighting along the white wall, a video image of the sky or "Luce" is projected under the bride's feet. "All guests who experienced the wedding ceremonies here are very happy and satisfied," Mr. Edamura expressed his satisfaction with the superb results of the new video projection system. The initial project was to refurbish the main building, but that plan was changed last minute, and the new wedding hall was built from scratch in the new building. The processes of formulating the concept for the new wedding hall and selecting the new video image system were carried out promptly, headed by Mr. Nakayamasou. We asked him about the introduction of the new video system and the effect it has on the viewers. 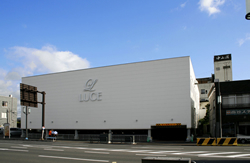 The Hotel Nakayamasou, an old establishment in Miyakonojo City, Miyazaki Prefecture, has built a new hall serving as a wedding hall called "Luce." In the chapel, the popular "Catchyoo" system has been installed in order to create beautiful and magical video images under the bride's feet. Colorful video images are created by Panasonic projectors. The Hotel Nakayamasou has earned itself the reputation of an old-established prominent hotel in Miyakonojo City for more than half a century. Traditional wedding ceremonies and reception banquets had been conducted in large numbers. In 2007, the new modern ceremonial hall, called the wedding hall "Luce", had been built to suit customers" needs of today's generation with a diversified sense of values. "Initially the project had focused on refurbishing the main building. As we kept brainstorming ideas on the project about one thing or another, President Mr. Nakayama made the bold decision to build a new ceremonial hall", says Mr. Edamura. The new hall building project popped up unexpectedly. There was only one year left for having the new hall built. However, we had numerous meetings with the design office in a short span of time, and the finished results are quite satisfactory. Due to space and building constraints, the center aisle became eight meters long, but the finished result looks quite pleasing," says Mr.Edamura. Two units of the PT-D5700 projector project the video images on the aisle of the eight meter-long center aisle. 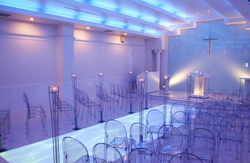 Numerous customer-oriented ideas have been incorporated in the new wedding hall. The most difficult theme consisted of what and how to produce the rendition of the center aisle during the wedding ceremony and reception. 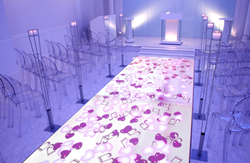 "Our initial idea was to use reinforced glass panels for the center aisle and to light them up. The initial idea became unfeasible, since the floor on the second floor could not withstand the stress," says Mr. Edamura. At the time, Mr. Nakayama visited the Japan Bridal Fair, an industrial convention held in Tokyo. "Mr. Nakayama had never been there before, however, he ended up going this time for some reason or other" says Mr. Edamura surprisingly. "Mr. Nakayama stumbled upon the "Catchyoo" demonstration by the General Business Machine Co., Ltd. (GBM hereafter), and immediately became interested in the system. As soon as he came back, he requested us to get in touch with GBM. When we contacted them after examining their website, they responded quickly by offering a demonstration, which eventually lead to the installation of the system." Proactive research activities by the Hotel Nakayamasou contributed to the introduction of this new system. The "Catchyoo" system, takes advantage of the latest computer vision technology, and provides unprecedented special video image effects. Key features include the following. (1) In "Particles" mode, flower petals or logos scatter around on the floor interactively as people move. (2) In "Water" mode, water ripples are rendered giving the impression of walking on water. (3) In "Reveal" mode, the lower image of the two overlapping images is revealed as motion is detected, etc. The Hotel Nakayamasou has prepared its own unique video images suitable for wedding ceremonies and receptions. The video images follow the movements of the bride's feet. (simulated by a rolling ball above). Different images can be projected from the two projectors as well. The flexibility and ease of design enabled this heart-shaped pattern created by the Hotel Nakayamasou. The "Catchyoo" system has been supplied by GBM. They have been promoting the "Catchyoo" system together with Panasonic projector PTD5700, which offers excellent reliability by adopting a proprietary design of a dual lamp system in addition to the high brightness and high picture quality. The lens centered design gives users the ease of installation. 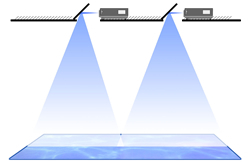 Particularly in order to project video images on the floor for image rendition under people's feet, the projector must be built-in the ceiling. The ease of design is one of the key factors for the projector selection. After comprehensive comparisons, the selection of the PT-D5700 projector has been most gratifying for GBM. Achieving a high number of wedding ceremonies, far exceeding past figures, the "Luce" at the Hotel Nakayamasou has been experiencing great success beyond its expectations. 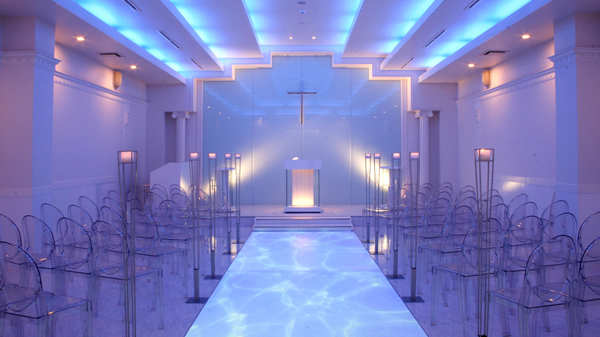 This great success is attributed to their century long philosophy on hospitality to "Wholeheartedly provide peace and serenity," boosted by the new wedding hall "Luce." Video rendering of the center aisle in the chapel is playing a key role for the improved business performance. People who visit to the facility are really excited about the beautiful rendition of the center aisle. 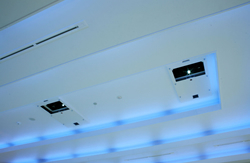 Two PT-D5700 projectors are installed in the ceiling. The mirrors perpendicularly reflect the images onto the floor. * Japanese model name for PT-D5700 is TH-D5700.